It is a well-known fact that the working life of the artist is many-sided. Actors, painters or dancers have always been jobbing in the catering industry or education to help them achieve their real dream: to be an autonomous artist. In economic terms this would mean the artist can live off his or her art. 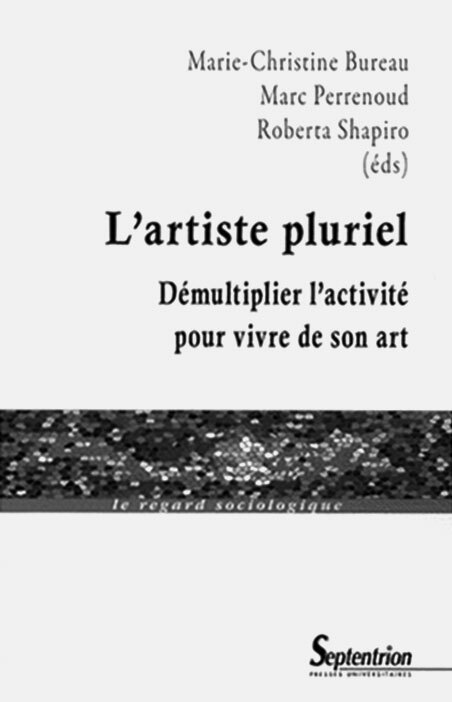 In L’artiste pluriel: Démultiplier l’activité pour vivre de son art (The Plural Artist: Diversifying Your Vocation to Make Art Your Living) a number of researchers demonstrate that this plural professional practice applies to almost all disciplines in the world of art. Musicians, comedians, artists, actors, architects and dancers – whether classical or hip hop – all come under scrutiny. And in all these different professional fields the researchers find plural activities. Differentiated professional practice is what lies at the core of artistic existence. But how do we define ‘plural’? Marie-Christine Bureau and Roberta Shapiro comment in the book that different notions of this concept can exist side by side. In their introductory chapter they aim to create conceptual clarity by pointing to the distinction that needs to be made between polyvalence, polyactivity and pluriactivity. Artists employed in a polyvalent capacity carry out different tasks within their own artistic discipline. One could, for example, be an actor and also do administrative work at the same theatre company. The polyactive artist, on the other hand, fills a number of posts in different fields. The well-known example of the artist who also waits tables in a restaurant comes under this category. And the term pluriactivity, finally, is reserved by the authors to distinguish between activities within their own artistic ‘metier’, such as the musician who is also a sound engineer. Interestingly, Bureau and Shapiro point out that pluriactivity has an economic as well as a legal or even political dimension (though they do not literally use these words). Thus economic motives underlie pluriactivity: in short, one keeps down several jobs in order to make a living. In addition, the legal or social status of an artist plays a role. In those countries or regimes where the government guarantees job security, pluriactivity is less prevalent. It is not surprising that in Russia, for example, pluriactivity doubled between 1992 and 1996. So the redefinition of the artistic profession that has taken place during the last few years has something to do with the extent to which government intervention has changed. A political shift has come about, but this factor is barely examined by the different authors in L’artiste pluriel. The authors identify a third dimension over and above the economic and political. If an increasing pluriactivity fuels the debate over the identity and autonomy of the artist, then the status of the artist in society becomes unclear. This, then, could be characterized as a sociocultural dimension. Although Bureau and Shapiro establish some conceptual clarity by differentiating within the artistic profession, the various authors in the book each tackle the subject in their own way. And this causes, to put it mildly, considerable disparity in their approaches and points of departure – in terms of both methodology and research focus. Thus Janine Rannou and Ionela Roharik approach the phenomenon in the world of dance from a largely quantitative angle, while Emmanuel Sulzer makes use of in-depth interviews. And while the latter chooses to focus on the art academy, others address issues relating to employment or policy contexts. This heterogeneity turns L’artiste pluriel into a somewhat ... plural book. The majority of the individual contributions do furnish interesting insights into the specific art worlds they study, but the great diversity in approach excludes the possibility of a comparative framework. Questions such as: is professional practice in the theatre world more or less pluriactive than that in, let’s say, the world of fine arts – remain unanswered. In spite of much sound and empirically well-supported data, the book does not rise above being a loosely connected assortment of impressions concerning artistic professional practices within divergent disciplines. This ‘impressionistic’ approach, moreover, is strengthened because most of the articles fail to include a historical dimension. That professional practice today is pluriactive is demonstrated with great zeal, but very little empirical evidence is offered for answering the question of whether it is more so now than in the past. Neither is it clear, therefore, whether a growing pluriactivity is taking place in response to society today, or whether that activity is suddenly being extensively recorded because it has become a cause of interest to sociologists and other academics. The question is: Are we faced here with a self-fulfilling prophecy? In other words, are sociologists finding more pluriactivity today because we are looking for it? Furthermore, we do not find out in L’artiste pluriel whether the contents of pluriactivity have changed over time. Were artists in the past, for example, employed chiefly in the catering and education sectors, and are they today maybe increasingly sought after by the creative industry? In other words, are artists today being absorbed in the mainstream economy on the strength of their specific artistic, creative capabilities? Antonella Corsan and Marizio Lazzarato do touch on the influence of the cultural industry on professional practice in the margins of their description of the current problematic phenomenon of project work and contracts. But even they do not reach beyond a neat typology of the so-called ‘intermittents’. In other words, a macro-sociological and macro-economic perspective is lacking in the book. This is a shortcoming of more than one of the contributions in L’artiste pluriel, which is why the book barely gets beyond the descriptive level. Apart from the occasional reference to a retreating government, the reader is presented with little in the way of explanatory factors for the present-day work situation of the artist. And this while there are several lines of interpretation, theoretical pistes even, for the taking. Thus we have labour-sociological and also philosophical theories on post-Fordian labour conditions, as well as social and politicoeconomic phenomena such as globalization and worldwide neoliberalization, which could offer a more consistent interpretative framework for the pluriactivity they identify. Angles like these could have added to the coherence between the widely divergent pieces in L’artiste pluriel. This is not to say that the book does not provide us with interesting insights into the current – sometimes precarious – professional situation of the artist today. The greatest merit of L’artiste pluriel may well lie in the fact that it tickles the appetite for further research about the doings of that curious profession that is the artist’s in society today.